In a second-floor hallway at Laney College, on a wall outside the football team meeting room, hangs a framed No. 22 Denver Broncos jersey. John Beam, the Oakland school’s head football coach and athletic director, placed it there to inspire the next generation of Eagles players. Anderson invited Beam to Super Bowl Opening Night on Monday in San Jose. As several reporters waited to interview the Broncos’ running back, Beam and Anderson embraced before posing for a photo. The 24-year-old Vallejo native was intent on celebrating his sport’s biggest stage with the people who helped him reach this point. Five of them — his grandmother and immediate family — will be in the stands Sunday at Levi’s Stadium. A host of others, from youth-league coaches to guidance counselors to professors, will be watching on TVs throughout the Bay Area. He grew up in Vallejo’s Country Club Crest, where drugs and violence belie the neighborhood’s name. His mother, Neva Craig, worked 17 years at Burger King, largely as a manager, before taking a job in an elementary school lunch room when Anderson was 10. Neva and Anderson’s grandmother, Barbara Gaddies, raised the talkative young speedster on basic principles: Watch what you put in your body, and try hard in school. To this day, Anderson doesn’t smoke or drink. Mastering schoolwork, however, proved more difficult for him. As a quarterback/running back at Bethel High, he ran for nearly 4,000 yards and made four playoff appearances. A handful of Power 5 conference coaches were interested in signing him as a defensive back. Poor grades landed Anderson at Laney, where the football team is composed almost entirely of Bay Area residents. The Eagles have no other option, of course, because they can’t offer on-campus housing and local rents are prohibitively expensive. Four days a week, Gaddies and Anderson awoke at 3:45 a.m. Gaddies ferried her grandson to the bus station so he could take BART to Laney. Not once was Anderson late for the Eagles’ 6:30 a.m. lifting sessions. It was at Laney that he met Amir Sabzevary, a philosophy professor who made Anderson realize an important truth: An NFL career was impossible without a commitment to academics. After sharing carries his first year, Anderson settled in as Laney’s featured running back as a sophomore. Opponents regularly stacked the box to defend the Eagles’ run-oriented approach. Still, Anderson finished 2010 with 1,644 yards. He signed with Cal to join a lineage of elite running backs that included J.J. Arrington, Marshawn Lynch and Jahvid Best. But in two years in Berkeley, Anderson made just two starts. He led the team in rushing as a senior despite splitting the workload with Isi Sofele. In April 2013, Anderson watched on a Vallejo TV as 23 running backs were taken in the NFL draft. He wasn’t one of them. Anderson’s Denver-based agent, Peter Schaffer, connected him to the Broncos, who signed the free agent for a $12,500 bonus. His breakout performance came in Game 9 of the 2014 season, a half-hour from his childhood home. 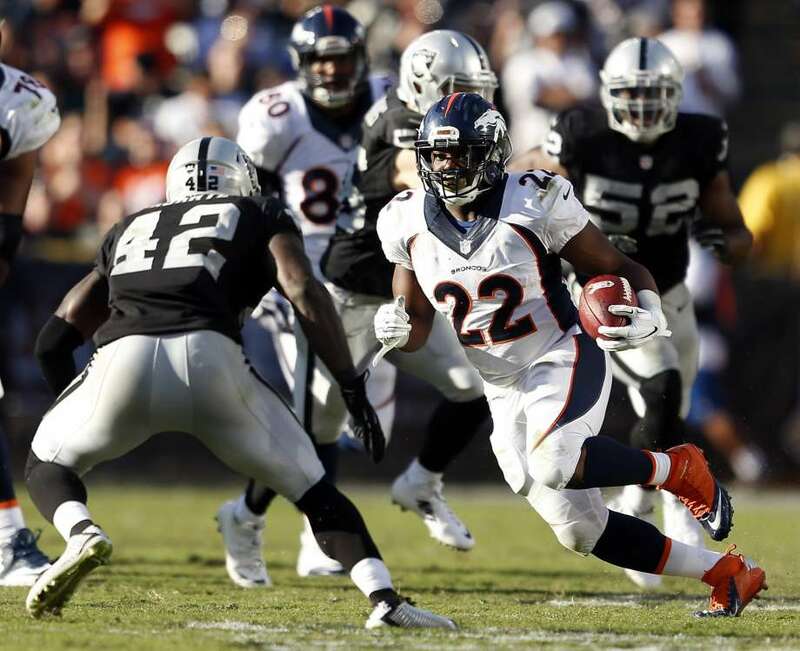 As running backs Montee Ball (groin) and Ronnie Hillman (foot) watched from the sideline, Anderson put together a 163-yard game (90 rushing, 73 receiving) against the Raiders at the Coliseum. Two months later, after a series of dominant outings, he became the fifth undrafted running back in NFL history to make the Pro Bowl. Anderson recovered from a sluggish start this season. Including the playoffs, he has rushed for at least 72 yards in four consecutive games. On Sunday, in his second Super Bowl appearance in three years, Anderson figures to receive the bulk of carries ahead of Hillman. It is a message underscored by that No. 22 Broncos jersey hanging at Laney.